Is your Journey an Adventure? I saw this image on the web and had to share it, as it caused me to think. It's about adventure, and the Camino de Santiago, the whole journey of life for that matter, is an adventure. 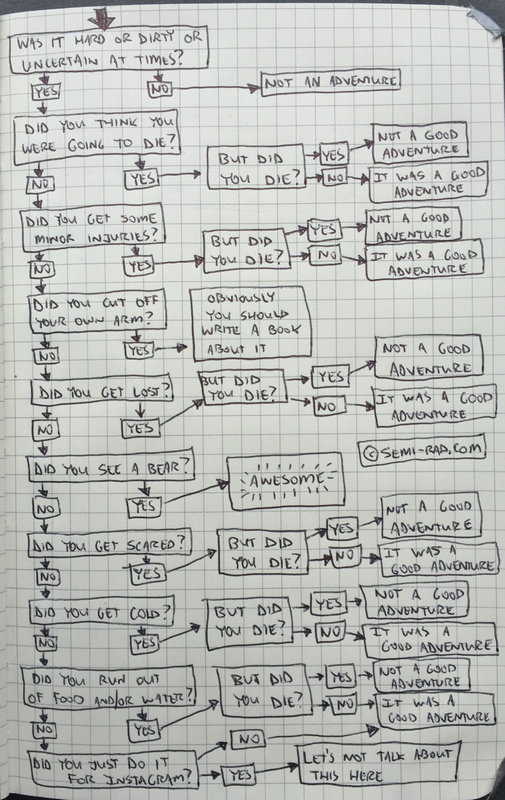 The picture is certainly a bit of fun with a whole lot of tongue in cheek about adventure. And, I hope you don't have to worry about cutting off an arm. Yet many times we worry about our difficulties and focus in on them, forgetting about the happiness we encounter. When deeply involved with those troubling times, we might not even see the joys of life around us. They're there, but we obsess about the tough parts. I certainly can get that way. Once I'm in pain or things aren't going as planned, I start worry about contingencies. Even if there's nothing I can do for the moment, it's all I seem to think about. In the end, though, as the picture suggests, if we aren't about to die, then it might not be as bad as we think. And, it might even add to the adventure. I recall the many difficulties I've had while traveling on vacation, on Camino, through life... They weren't fun at the time, and yet today, I sit back and tell stories about what happened. How I hurt or was scared or angry. In the rear view mirror, it doesn't look as menacing as when I was in it at the moment. So I'm try not to stay in that "are you about to die" moment, trying not to micromanage an outcome, to control what cannot be controlled. The world needs us to be present with each other, as well as with the trials testing us. If we can approach life and each other as the adventure that never stops exciting us, I think we'll find ourselves less fearful of the daily threats and troubles around us. We'll be able to see both sides, the unsettling side AND the joyful side. And then, then we can take pictures to remember, stories to tell... and post them on Instagram.